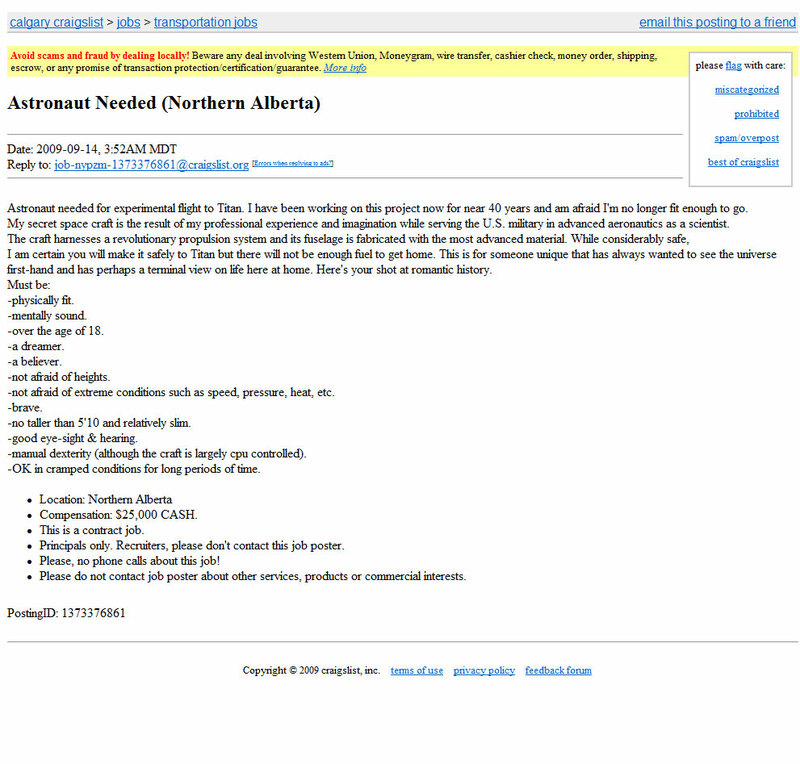 I missed it at the time, but about a month ago (September 14), the Calgary, Alberta edition of Craigslist ran an ad (since removed) under Transportation Jobs, titled ASTRONAUT NEEDED (NORTHERN ALBERTA). I’ve found a picture of the actual ad. Click on it again to enlarge. The job pays $25,000, and the successful applicant will get to see the solar system. There is a catch, though, and a big one. The proposed flight to Saturn’s moon is a one-way trip. No news yet on whether anyone volunteered, or on whether the alleged project actually exists in a remotely practicable form. 2 Feedbacks on "Astronaut Needed (Northern Alberta): One Way Trip"
Osama Bin Laden and his killer jihadists are following directly the teachings of the Koran and the divine example set by prophet Muhammad in the Massacre of Banu Quraiza, where Muhammad personally assisted in the beheading of 600 to 900 Jewish men and in order to distinguish young Jewish boys from young Jewish men ordered their pants pulled down and groin area inspected for pubic hairs by his SS known as – the Companions. Those boys with the slightest growth of hair were dragged away and beheaded. I have written a book (498 pages) ISLAM: EVIL IN THE NAME OF GOD for your consideration exposing the truth and very grave danger posed to all freedom loving peoples by Islam. My mother -in-law’s best friend’s son (25 years) who worked at the Twin Towers had a day off from work scheduled for 9/11. Late at night 9/10, he received a call from an associate who had taken ill and asked if he wouldn’t mind covering the next day and in return he would trade his day off the following week. He left for work at 6:00 am on September 11 and was dead by 9:30 am. There must be dozens of stories just like this one. This young man and the 2,972 were murdered so their 19 Muslim killers who “fight in the way of Allah and shall slay and be slain” could ascend to Paradise. Indeed, the only way Muslim men can be guaranteed accession to Paradise is to slay or be slain in the service of God. Read the book for the brutal reality of this very evil ideology.